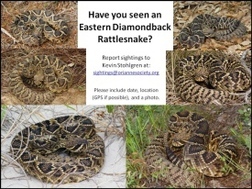 DNR wildlife updates: Seen these snakes? Seen these reptiles in Georgia? Wanted: Georgia sightings of eastern diamondback rattlesnakes, southern hognose snakes and Florida pine snakes. Oh, and spotted turtles, too. These four reptiles are among the native Georgia species petitioned for listing as threatened or endangered under the nation’s Endangered Species Act. The Georgia Department of Natural Resources is helping the U.S. Fish and Wildlife Service review the status of each in the state. While snakes and turtles can be difficult to survey in general, these four Coastal Plain species can be particularly hard to find. They blend in by design: Florida pine and southern hognose snakes even live underground most of the time. Habitat loss and other factors have made them all uncommon. 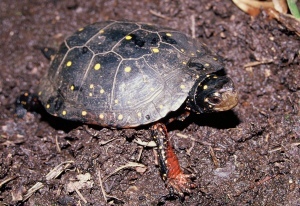 Having more eyes in the woods – and on the water, in the spotted turtle’s case – can provide helpful data on species occurrences and ranges, according to John Jensen, a senior wildlife biologist with the DNR’s Nongame Conservation Section. “We can get observations that show the particular species still exists at an area where we have historical records … and we can also get new localities where we don’t have records,” Jensen said. Researchers can then evaluate habitat in the area by aerial photography, and even check specific sites. Everyone from homeowners to hunters – who are in the woods across Georgia as hunting seasons kick in – can help with this effort to determine how rare these animals are. Email digital images of the species live or road-killed, along with the date observed, exact site (GPS if possible) and observer’s name to the following project contacts. Records will be compiled through 2015. The definitive guide “Amphibians and reptiles of Georgia” (UGA Press). DNR’s newly updated “Venomous snakes of Georgia brochure.” Download a copy or pick up one at a Wildlife Resources Division region office or from project partners including the University of Georgia Cooperative Extension Service, Georgia Southern University Center for Wildlife Education and Southeastern Reptile Rescue. Over the past century, a host of roosting and nesting boxes were developed to benefit wildlife species from wood ducks and bluebirds to fox squirrels and prothonotary warblers. The manmade structures have proved invaluable in enhancing habitats for these animals. A few decades ago, the butterfly box – also called a hibernation box – appeared and was marketed as a place for butterflies to hibernate. Because the tall, slim structures are attractive and supposed to help butterflies, newspapers and garden and nature magazines were quick to promote this new innovation in backyard wildlife management. I saw my first butterfly box about 20 years ago when the owner of a farm and garden center brought me one while I was manager of what is now DNR’s Nongame Conservation Section. He said that although some of his customers were asking about butterfly boxes, he didn't want to sell them until he knew they worked. I agreed to test the box for him, and mounted it on a split rail fence in the yard of the Nongame offices near Forsyth. During each of the next few several winters, I checked the box but never found a butterfly inside – although it was a haven for wasps and spiders. Eventually a pair of brown-headed nuthatches took a shine to the box and enlarged one of the long, thin entrances enough to enter and build a nest. Since, a steady stream of young nuthatches has fledged from the box. Read Terry's full column to learn what they found, and why these so-called hibernation boxes aren’t as advertised. PS: And if you do put up a butterfly box, please let Terry know what – if anything – uses it! Terry W. Johnson is a former Nongame program manager with the Wildlife Resources Division and executive director of TERN, the Nongame Conservation Section’s friends group. “Out my backdoor” columns archives. Georgia is a morbillivirus suspect state after three bottlenose dolphin carcasses in South Carolina tested “suspect” positive, meaning the dolphins likely had the infectious pathogen. Cetacean morbillivirus is blamed in the deaths of more than 600 dolphins from New York to North Carolina this year, spurring NOAA’s declaration in July of an Unusual Mortality Event in the mid-Atlantic region. The South Carolina strandings suggest the disease is spreading south, which scientists expect as migratory dolphins move south for winter. Because of the suspect-state status, dead dolphins found in Georgia will be sampled for the virus, said Nongame Conservation Section biologist Clay George, who heads DNR’s Marine Mammal Stranding Program. The federal government shutdown has hobbled the effort to track morbillivirus, with furloughs sapping beach monitoring at national wildlife refuges and parklands and the National Oceanic and Atmospheric Administration warning that its websites may not be updated until appropriations are enacted. Report a stranding on the Georgia coast by calling 1-800-2-SAVE-ME (1-800-272-8363). Kudos to Partners in Amphibian and Reptile Conservation, which received The Wildlife Society’s Group Achievement Award during the society's annual meeting in Milwaukee. Partners in Amphibian and Reptile Conservation, dedicated to conserving herpetofauna and their habitats, joins noted recipients such as the Wildlife Management Institute and Association of Fish and Wildlife Agencies. DNR is a founding member of the organization most call PARC. Genetic “fingerprinting” of loggerhead sea turtles in Georgia and the Carolinas will continue at UGA through a $1.3 million grant from NOAA via Georgia DNR. Started in 2008, the project uses DNA from an egg in each nest to identify nesting females, helping researchers gauge population dynamics for loggerheads, including how well the federally threatened species is recovering. Nongame Conservation aquatics staff searching the chilly Tennessee and upper Coosa River basins in northwest Georgia found a few heart-warming surprises: a live Cumberland moccasinshell and live Tennessee pigtoe mussel. The first hadn’t been documented in Georgia since 1971; the Tennessee pigtoe, not since 1963, according to aquatic zoologist Jason Wisniewski. Fellow zoologist Dr. Brett Albanese found his way into the winners’ circle in the Georgia River Network photo contest. Albanese’s shot of an Ocmulgee shiner (left) led all entries for June. CoastFest drew nearly 9,500 people to DNR Coastal Regional Headquarters in Brunswick Saturday. Meanwhile, turnout for Outdoor Adventure Days, also held Saturday throughout the state to mark National Hunting and Fishing Day, included an estimated 3,250 at James H. (Sloppy) Floyd State Park near Summerville, 1,200 at Unicoi State Park in Helen and 1,200 at Paradise Public Fishing Area near Tifton. Video of a dolphin rescue last month by DNR and UGA Marine Extension Service was picked up and profiled by GrindTV, part of GrindMedia and associated with Yahoo! Sports. Nongame and UGA staff cut a crab pot line the dolphin’s tail had become entangled in, video that has also fielded more than 1,000 views on the Wildlife Resources Division’s YouTube channel (subscribe for updates; it’s free!). Nongame botanist Dr. Mincy Moffett led a Georgia Plant Conservation Alliance workday last month at a Rabun County mountain bog. The group created a new lens, or small canopy opening; discovered 50 new purple mountain pitcherplant seedlings; and played host to the “Georgia Outdoors” film crew and University of Tennessee researchers taking deep sediment samples (“Archives in Appalachian bog sediments,” Sept. 26, 2012). From endangered species to creatures of the night programs, Charlie Elliott Wildlife Center -- just southeast of Atlanta -- offers an engaging lineup of outdoors learning opportunities for young and old. See the center’s new 2013-2014 program calendar. 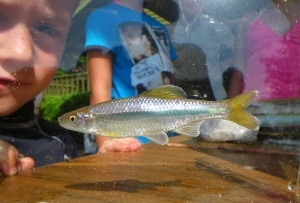 The 19th annual meeting of the Robust Redhorse Conservation Committee, held Oct. 1-3 at Charlie Elliott Wildlife Conference Center, covered ongoing research and conservation activities for this rare sucker in North Carolina, South Carolina and Georgia. Key work in Georgia includes monitoring spawning habitats in the Oconee, Ogeechee and Broad rivers. Oct. 17-18: Annual Georgia Plant Conservation Alliance symposium, Callaway Gardens. Oct. 26: Bird-banding starting at 6:50 a.m. at Panola Mountain State Park, Stockbridge. Other banding dates and times at Panola: Nov. 2 (6:55 a.m.), Nov. 1 (6:10 a.m.), Nov. 16 (6:10 a.m.), Nov. 30 (6:20 a.m.), Dec. 7 (6:30 a.m.), Dec. 28 (6:40 a.m.). Charlie Muise, Georgia Important Bird Areas coordinator. Oct. 27: Bird-banding starting at 7 a.m. at Joe Kurz Wildlife Management Area, Woodbury. Other banding dates and times at Joe Kurz: Nov. 15 (6:20 a.m.), Nov. 22 (6:30 a.m.), Nov. 29 (6:30 a.m.), Dec. 6 (6:40 a.m.), Dec. 20 (6:30 a.m.). Charlie Muise, Georgia Important Bird Areas coordinator. 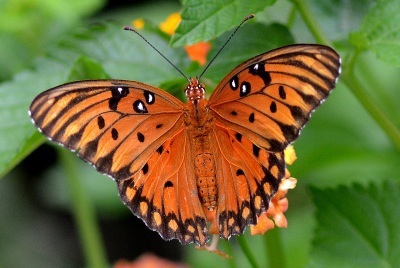 Nov. 8-10: Becoming an Outdoors-Woman, Charlie Elliott Wildlife Center. "Rare salamanders found in Northwest Georgia," Rome News-Tribune. Also, "Friday blog: Good for salamanders, not people?" wildlife. Nongame includes wildlife not legally fished for or hunted, plus native plants and natural habitats.